Blockchain technology will power a new registry for mapping all of the human heritage artifacts on the moon. A new partnership is applying blockchain technology to keep track of some valuable bits ... of space exploration history. For All Moonkind, a nonprofit dedicated to protecting and preserving the relics of human heritage in outer space, has joined with TODAQ, a blockchain-based financial services marketplace, to map the moon, registering cultural artifacts and locations where humans have landed spacecraft and astronauts to explore the lunar surface. In January, the idea to catalog heritage sites in space was included in a draft resolution prepared for the science and technology subcommittee of the United Nations Committee on the Peaceful Uses of Outer Space. 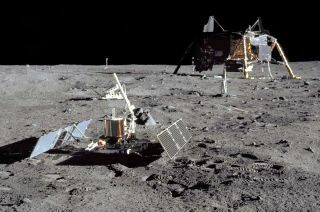 In March, the White House submitted to Congress a report endorsing the need to protect and preserve the U.S. Apollo moon landing sites, especially in light of increased interest in new lunar missions by international space agencies and commercial companies. President Donald Trump also directed NASA to return U.S. astronauts to the moon as part of its exploration priorities. For All Moonkind and TODAQ will work together to create, develop, publicly disseminate and maintain a decentralized grid-referenced system of heritage sites on the moon that should be designated for preservation and some degree of protection. This blockchain-enabled archeological atlas will include sites such as Tranquility Base, where humans set foot on the moon during the Apollo 11 mission, and sites at Mare Imbrium, where the Soviet Union's Luna 2, the first human-made object to reach another celestial body, impacted, and later where the robotic rover Lunokhod 1 drove across the regolith. Though today most often associated with cryptocurrencies such as Bitcoin, blockchains can be used to securely keep any growing list of records. TODAQ will design the system to identify heritage sites for the "For All Moonkind Moon Register," which will be based on its blockchain protocol, TODA. "While the majority of economic and human activity is here on Earth, none of our modern world would function without the contribution of our collective space-based efforts," said Hassan Khan, TODAQ's CEO and co-founder. "Building an immutable framework that can help preserve our common heritage and lay a foundation for future societal interaction in space is vital to start now, and we are proud to support this initiative." Blockchain technology is suited for an international registry of lunar human heritage sites, said Hanlon. The approach takes the registry outside the realm of national sovereignty and opens the cataloging process to everyone. "Thinking forward to the day when we have protocols for deciding how much protection any given site should have, it allows great transparency and flexibility in that decision-making process," Hanlon told collectSPACE. "The registry will be dynamic. If we use a committee, member votes on each site will be recorded." "And again, thinking forward, if we obtain the commercial buy-in that we are focusing on right now, any company that goes to the moon will check into the registry," said Hanlon. "Ultimately, there will be a record of every site on the moon and who has accessed that site, which is important for the chain of custody of artifacts and instruments, as well as property claims." Hanlon said she is grateful for the support and forward-thinking of TODAQ. "Preserving our history in space is the first step to assuring the sustainable development of space resources, success of an off-Earth community, and ultimately the evolution of humanity into a multi-planetary species," she said. Disclosure: The author of this article, Robert Pearlman, is a member of the leadership board of For All Moonkind.